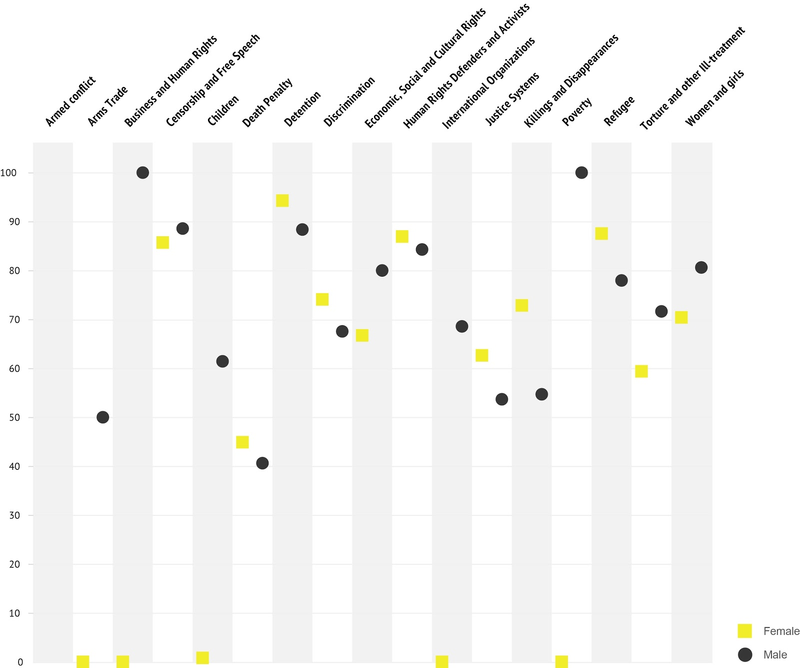 The following research and designs were undertaken as a collaboration between the Digital Methods Initiative, Density Design and Amnesty International at the Digital Methods Summer School 2016. The research team included: Jonathan Gray (facilitator), Olga Boichak, Agata Brilli, Claudia Minchilli, Coral Negrón, Mariasilvia Poltronieri, Chiara Riente, Gülüm Şener and Paola Verhaert. Thanks also to Liliana Bounegru, Ben Fogarty, Milena Marin and Richard Rogers. The slides for the final presentation are available here. The campaign aimed to “mobilise public opinion quickly, and widely” against these abuses, as well as to “collect information about the names, numbers, and conditions” about what they described as “Prisoners of Conscience”. 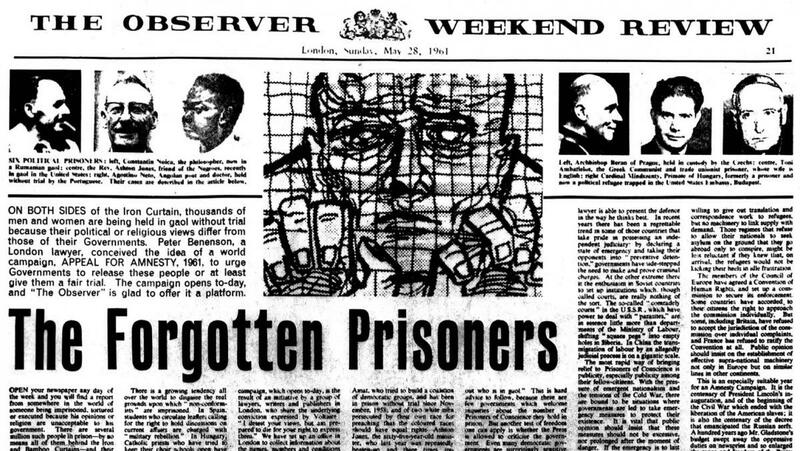 Noting the dearth of official statistics about these abuses, collecting information became a central part of the campaign which included establishing an office in London “to collect and publish information about Prisoners of Conscience all over the world” (Benenson, 1961). These practices of collecting information about abuses may be understood both as a form of “witnessing” (Peters, 2001), as well as a form of “statactivism” (Bruno, Didier, & Vitale, 2014) which prefigures contemporary forms of “proactive” data activism – including projects to collect data as a means to render institutions sensitive to different issues and concerns in society (Gray, Lämmerhirt, & Bounegru, 2016). In March 1973, Amnesty International launched their Urgent Actions in order to mobilise a rapid response from their networks of volunteers by writing appeals to authorities in situations where there is a risk of abuse. Initially focusing on sending letters and faxes, these Urgent Actions were also undertaken online from 1987 (Willetts, 2010). In June 2016 Amnesty launched their Amnesty Decoders project, dedicated to creating a network of “hundreds of digital volunteers helping us expose human rights violations, one click at a time” (Amnesty International, 2016). Their first project was a crowdsourcing project to analyse a digitised collection of tens of thousands of Urgent Action documents in order to “understand when and where [Amnesty’s] campaigning has been most effective”. The Amnesty Decoders crowdsourcing project was developed as a collaboration between the Amnesty International; two NGOs: Open Data Kosovo and the Engine Room; the startup incubator Focal Labs; with funding from the Swedish Postcode Lottery. It grew out of an interest in harnessing the “collective wisdom of crowds to shed light on and respond to human rights abuses” (Marin, 2015). The project presented users with a digital copy of an Urgent Action document and asked users to answer questions about them, including how many people were subjected to abuse, the names and genders of those affected, and whether the outcome of the action was “positive”, “negative”, “mixed” or “not clear”. There have been tens of thousands of Urgent Actions issued by Amnesty International. The Urgent Action documents selected were from a collection of 2,800 “stop actions”, which are the final action documents sent out - usually giving the outcome of the campaign (such as whether the prisoner was released or executed). These documents were loaded into a website created using the open source Pybossa framework. 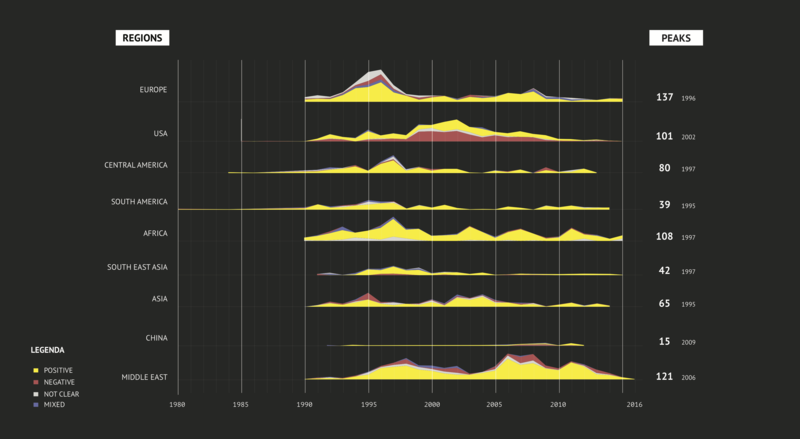 We analysed databases from the Amnesty Decoders project in order to understand how digital volunteers engaged with the crowdsourcing project over a twenty four day period (from the “soft launch” on 7th June to 30th June 2016), as well as looking at trends in the stop actions data from 1980 to 2016. 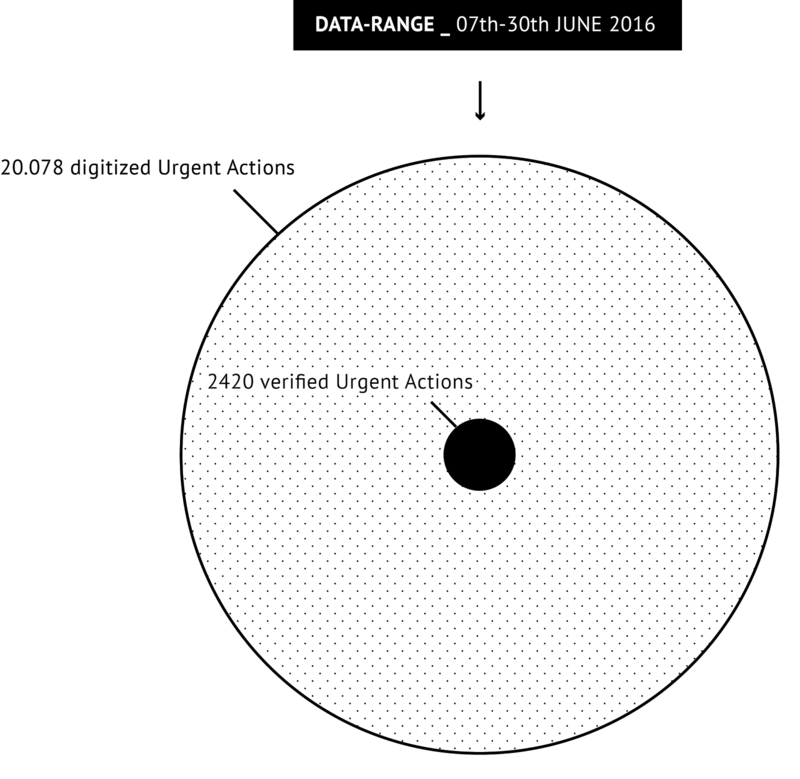 What proportion of the digitised Urgent Actions were verified? Overall, the verified actions represent a comparatively small subsection of all of the Urgent Actions that have been digitised by Amnesty International which was important to bear in mind when analysing the database. 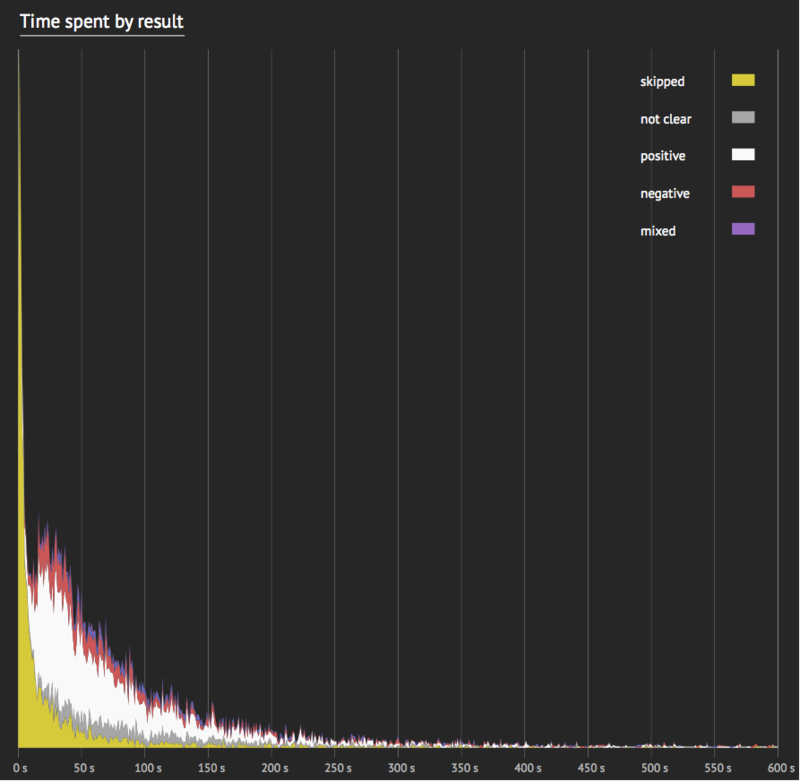 How did users engage with the crowdsourcing project? On the 7th June 2016 the project was launched, and this corresponded with the highest volume of visits. Messages were sent to all Amnesty volunteers including instructions on how to participate. On the 13th June 2016 an online bulletin was sent to the youth activist network announcing the recently launched project and encouraged participation. On the 17th June 2016 Amnesty sent a reminder email to international supporters who didn't open it the first time. On the 20th June 2016 Amnesty sent a reminder to supporters who already took action, expressing thanks, giving an overview of how many people had already contributed and how many hours in total were spent analysing the data. There were 140 logged in users who had made less than 5 contributions. What does the Urgent Actions database tell us about Amnesty’s focus? 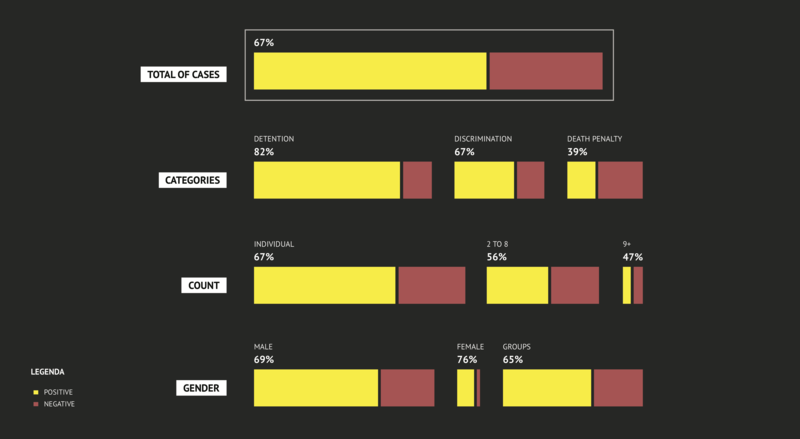 We used the verified sample of the Urgent Actions database which was read over and classified by the Amnesty Decoders project in order to see what we could understand about the geography and temporality of Amnesty International's activities. Since the creation of Amnesty International, the organisation has kept its central focus on the rights of the detained across the continents; even the first cases to draw the attention of the founding members were not confined to one continent (Buchanan, 2002). Ever since, Amnesty International has been organising campaigns, and from 1973 on, Urgent Actions, without taking into account the nationality of victims. The methods of action Amnesty International adopted from its creation on, allowed the organisation to adopt a pioneering role in the seizing of sovereignty by the international human rights network (Keck and Sikkink, 1998), and the creation of transnationally organised interest groups in civil society who sought to redefine what is essentially within the domestic jurisdiction of states through the propelling of the international human rights issue (Sikkink, 1993). Using the data sample from the Urgent Actions, we were able to map out the Urgent Action cases geographically, and analyse regional trends. 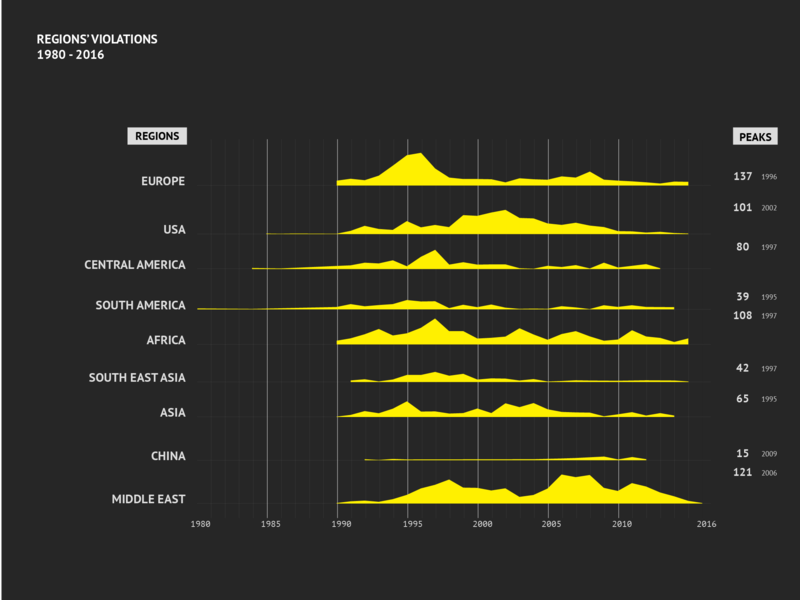 Violations by country over time. Categories of violations per country. 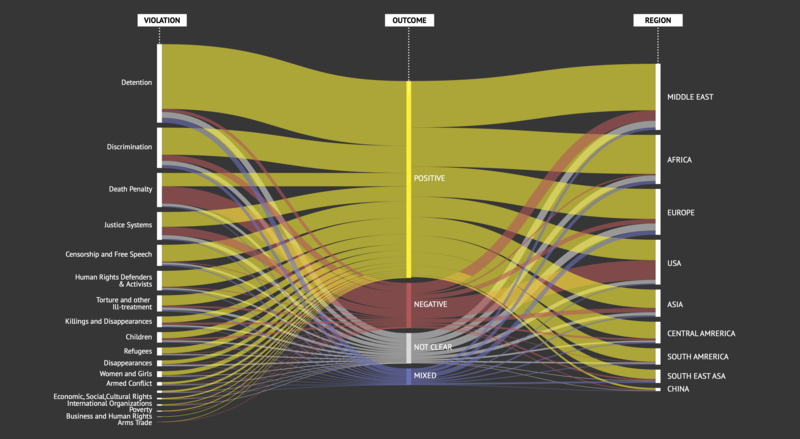 Proportion of positive and negative outcomes per country. We found that the region with most cases in the data sample is the Middle East with 1,409 cases, followed by Africa (1046 cases) and Europe (977 cases). The country with most violations in the Middle East is Iran (322 cases). The countries with the second and third most cases in the Middle East are respectively Syria (175 cases) and Saudi Arabia (116 cases). However, it is worth noting that Iran counts almost double the amount of Urgent Actions than Syria, making it adamant where Amnesty International’s focus within the Middle East has been. A quarter of the cases in Iran are related to detention (83 cases), making detention the main category in the cases against Iran. The temporality of the cases against will be explored below. In Africa, the countries with most violations are Sudan (224 cases), the Democratic Republic of Congo (79 cases), and Ethiopia (77 cases). Again, the country with most Urgent Action cases in the continent greatly outnumbers the runner-up. The largest category of violation in Sudan is related to detention (96 cases). Sudan, too, will be analysed below with regard to the temporality of the cases. 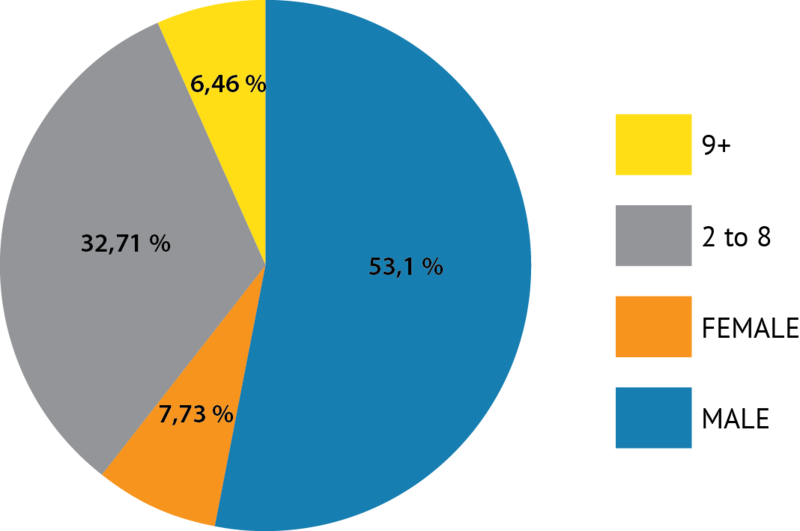 A total of 977 cases was counted for Europe in the data sample. However, it is worth noting that the country with most cases in Europe is Turkey, which has 486 cases, or, in other words, almost half of the total cases in Europe. Due to the high prevalence of cases in Turkey, the country was further analysed and profiled below. The United States is counted as a continent, because of the large amount of cases (955). As with Turkey, the country is analysed further below. Asia is the continent with the fifth largest amount of Urgent Actions, but has almost half of the amount of cases than the U.S. with only 486 cases. The country with most cases in Asia is by far Nepal (159 cases). Generally, the countries with most cases in the data sample are the U.S., Turkey, Iran, Sudan, and Mexico. The United States, as well as Turkey, are analysed in detail below in their respective country profiles. Iran and Mexico, are further analysed below. Chart showing Urgent Actions over time for different regions. The first case in the data sample dates from 1980, and the last case is from 2016. Within this time frame, there is a general spike in cases for the period from 1994 until 2004, when we can consistently count 245 cases or more. 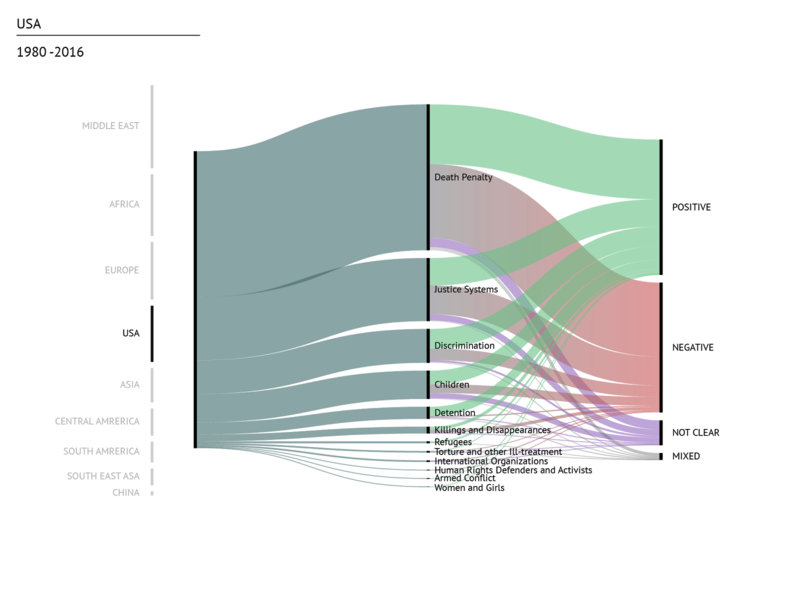 By breaking up the timeline by region and by country, this general trend can be analysed in more detail. The spikes vary by region. South America spikes in 1995, with 39 cases. During this year, Amnesty International mostly organised Urgent Actions in South America in Colombia, Peru, and Venezuela. For both Colombia and Peru, 1995 was a year with an increase in terrorism, violence and disappearances in the country. In Venezuela, strikes and social unrest lead to a number of cases of disappearances during this period. Asia sees a spike in Urgent Action cases in the same year, and counts 65 cases. 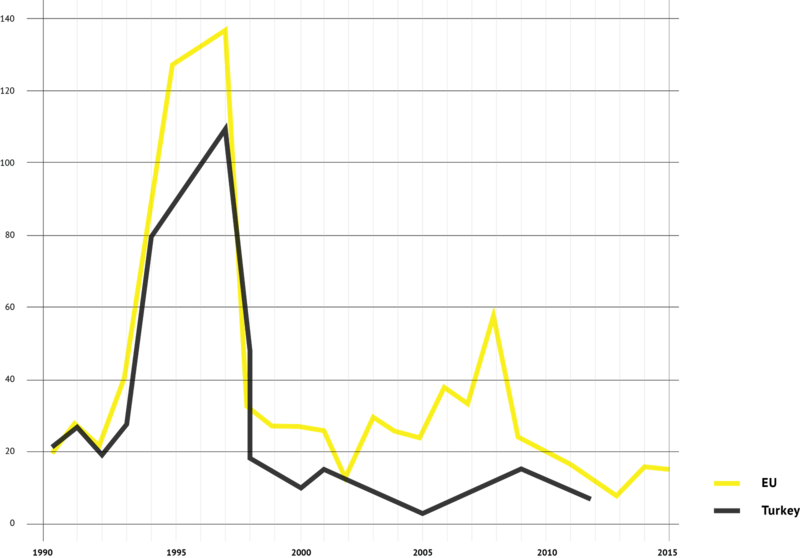 The main reason for this spike is the occurrence of Singapore in the data sample; in 1995, Amnesty International organised 26 cases against Singapore, and most of them are related to death penalty. In the history of Singapore, 1994 and 1995 were the years during which the government executed most prisoners (respectively 76 and 73 people). Europe sees a spike of cases in 1996 with 137 cases, which is due to the Civil War in Turkey. In 1996 alone, Amnesty International organised 108 Urgent Actions in Turkey. A more detailed analysis of Turkey is included below. 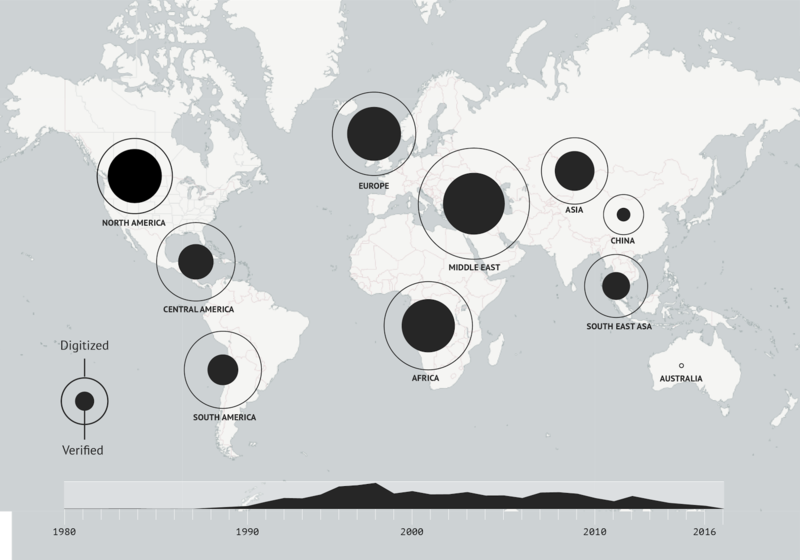 In 1997, there is a spike in Urgent Actions in Central America, with 80 cases. 61 of these cases were related to Mexico, where the War on Drugs was in full swing, and caused many disappearances (Dillon, 1997). In the same year, South East Asia knows its peak year with regard to the number of Urgent Actions (42 cases). More than half of these were aimed at Indonesia (28 cases), where president Suharto’s three-decade long presidency was slowly crumbling toward an end, mostly due to the Asian financial crisis, and Suharto targeted the growing number of opposition members. Also in the same year, Africa counted its largest amount of Urgent Actions, with 108 cases. The larger bulk of cases are distributed amongst Burundi, Kenya, and Nigeria. Burundi found itself amid a civil war, in Nigeria, Amnesty International campaigned to free several “prisoners of conscience”, among whom was Kenyan writer Ladi Olorunyomi, and finally, in Kenya, general elections took place, of which the aftermath lead to an increase of arrests and detainments. The next regional spike occurred in 2002, in the U.S. The country profile can be found below. The Middle East sees a spike in 2006, with most cases in Iran, Syria, and Yemen. 2006 proved to be a particularly tumultuous year for Iran, after Mahmoud Ahmadinejad won the presidential elections in 2005, the United Nations imposed several sanctions against Iran’s nuclear program, and the United States were rumoured to plan an attack on Iran. In Syria, the opposition spiked against the administration of Bashar al-Assad. Finally, in Yemen, general elections were organised in 2006, which Ali Abdallah Saleh won, and opposition members were subject to detention and execution. Finally, 15 Urgent Actions were organised in China in 2009. An estimated 5,000 prisoners were executed in this year, according to the Dui Ha Foundation (Dui Ha, n.d.). 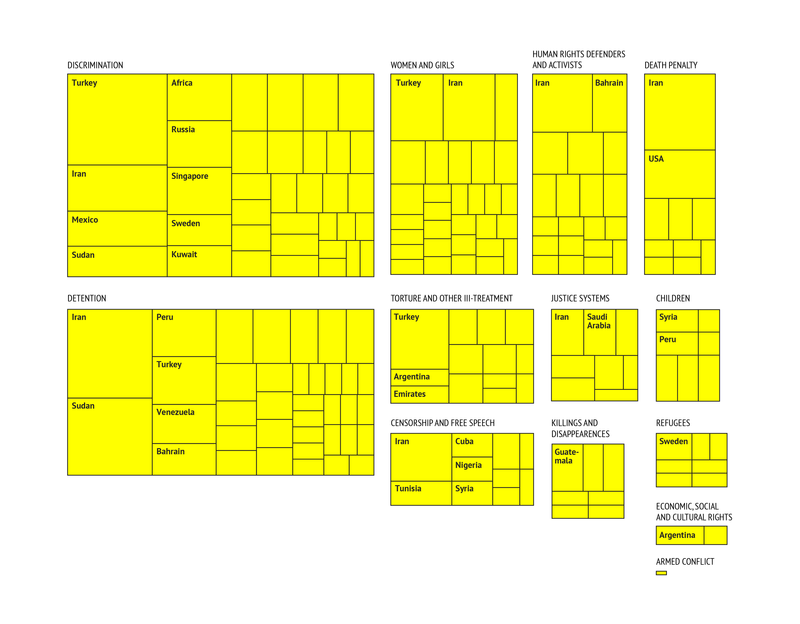 What kinds of worlds are articulated through Amnesty’s classificatory practices? In the centre we can see Amnesty’s founding concerns of “detention”, “discrimination” and “censorship”. In the peripheries we find other comparatively marginal topics such as “right to water”, “right to health” and “internet and social media”. One could make the case that this echoes Isaiah Berlin’s classic distinction between positive and negative conceptions of liberty – a pattern which is also echoed by recent historical work looking at how human rights advocacy has evolved from the post-war period to the present. 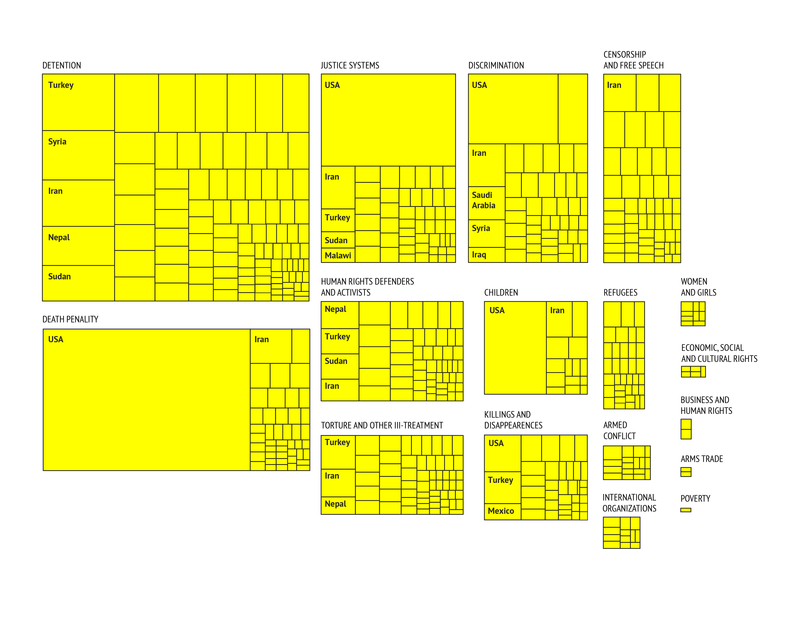 We also did an exploratory visualisation to look at the use of over 525 keywords that were used by Amnesty’s different offices to describe their work. These keywords were retrospectively reclassified in terms of 17 top level categories and 44 sub categories. 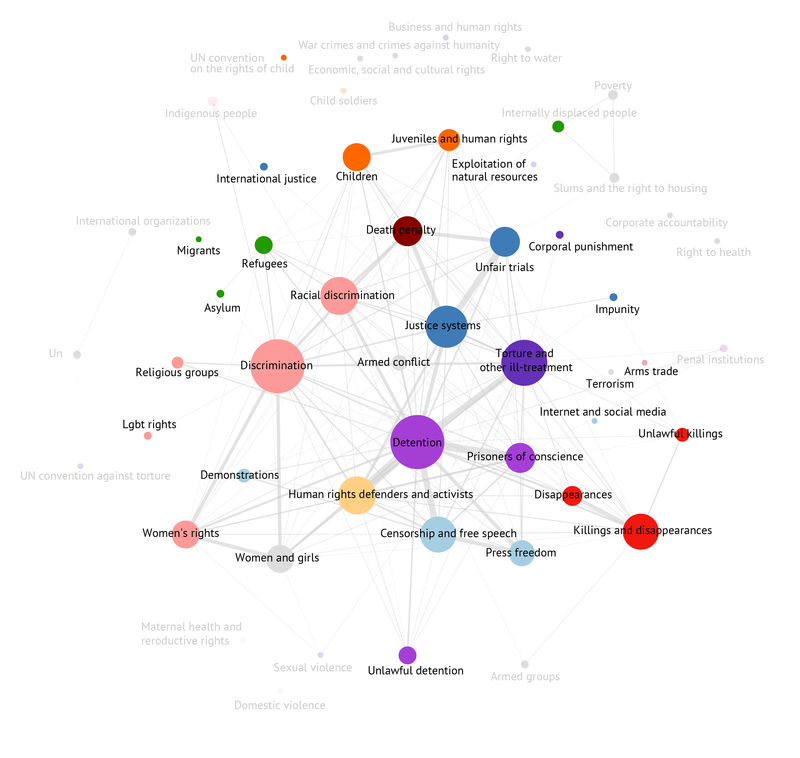 This can be used to explore the rise and fall of different kinds of “rights talk” over time. For example, we see the dominance of trade unions in the 1980s, which then levels off in the early 1990s. 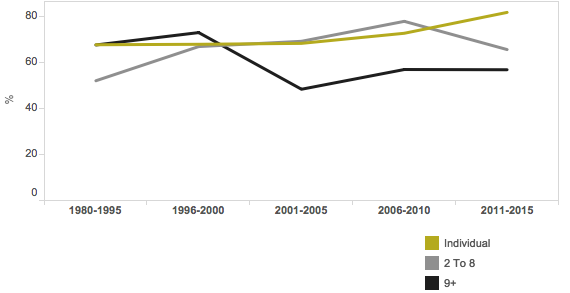 The category of women rises in the early 1990s and peaks in the mid 1990s. 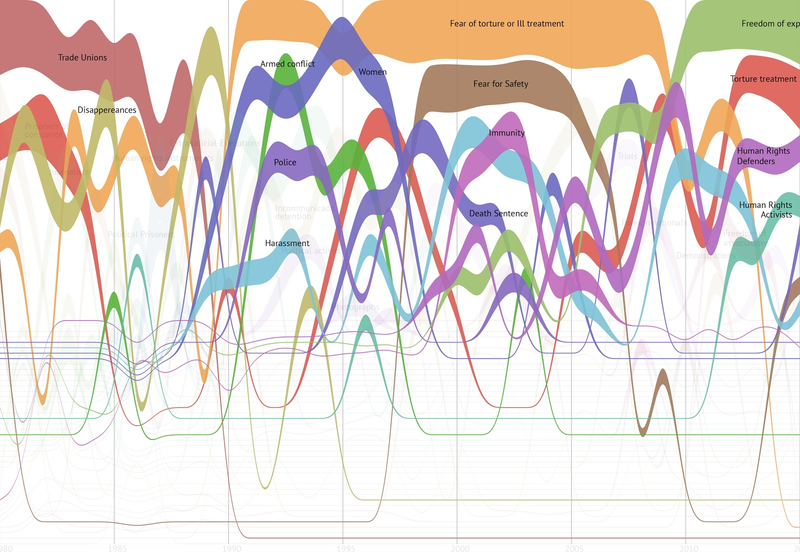 With the exception of this peak, the top category from 1990 to around 2010 is fear of torture and ill treatment. After 2010 it becomes freedom of expression. What makes an Urgent Action successful? In relation to groups of 2 to 8 persons , the average rate of success drops to 66.4% , and for larger groups of 9 persons and more the success rate is even lower at 63.6% . As we see from the chart, over half of the Urgent Actions in the verified dataset pertain to male individuals. Controlling for variation across geographical regions and across categories of violations, the average statistical likelihood of a positive Urgent Action outcome for both males and females is at 67.3%. However, the likelihood of a positive outcome for a group of 2 to 8 drops to 56.1%, and for groups of 9+ it is 46.6%. The results are statistically significant at a 99% level. If we delve deeper into the temporal dynamics of individuals depending on gender, we see a twofold increase in the positive outcomes among females, from 50% in 2001-2005, to a 100% in the past five years. However, it is important to note that, due to a small proportion of female cases in the sample, the difference between Urgent Action cases where the victim was male or female is statistically insignificant. Therefore, we can assume the projected likelihood of a positive outcome to be the same for both genders at 67.3%, as explained above. We also explored the proportion of different categories of violations by gender, in order to understand how recurrent are certain kinds of categories of violations and the main countries where these violations were perpetrated. From our analysis, we saw that there is a modest but recurrent correlation between male and female individuals in regard of categories of violation, and countries involved. 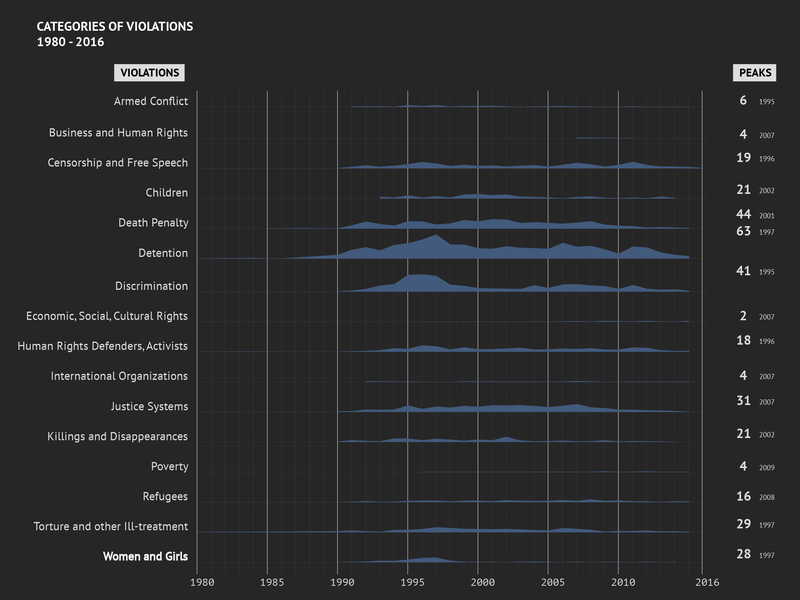 For female cases, we can see from this visualisation that Urgent Actions have been called out particularly for cases of Discrimination, Detention, and violation of Women and Girls' Human Rights which have been recurrent particularly in Turkey, Iran and Sudan, from 1980 until the present. For Urgent Actions on human rights violations pertaining to male individuals we can see that Detention is the major category, with Turkey, Syria Iran, Nepal and Sudan at the top in terms of number of cases. Interestingly, in the categories that follow Detention in terms of number, which are Death Penalty and Justice Systems, the United States is at the top with a huge number of cases, especially if compared with Iran and Turkey’s ones which appear as following countries in those categories. More generally, what is striking is, over time, the predominance of the United States in all the major categories that required Urgent Actions for male individuals, when, on the contrary, US presence is comparatively small for female cases. We decided to profile two countries with most cases in the sample dataset; the United States, which has a total of 955 cases, and Turkey, which has a total of 486 cases. We sought to create more detailed profiles for the U.S. and Turkey in order to contextualise the Urgent Actions in the verified database. The profiles were created based on the categories of the cases, where we focused on occurrence and temporality of the types of categories, and on the outcome of the cases. The United States tops the list of countries with the largest amount of Urgent Actions (955 cases). We define a spike in number of cases as a year with 50 or more cases. 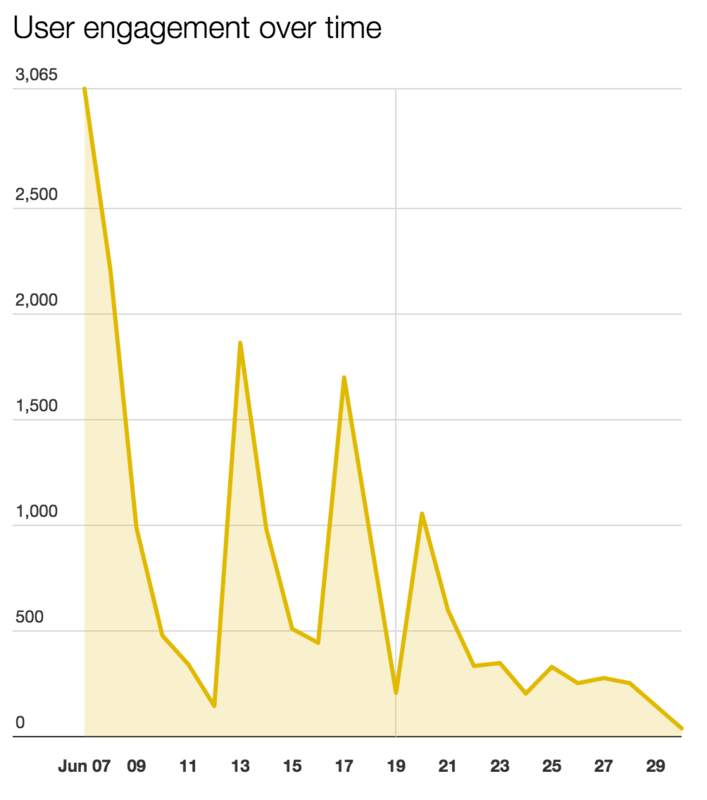 In this case, there are 7 spikes in the dataset (1995, 1999, 2000, 2001, 2002, 2003, 2004). The year with the most cases is 2002 (101 cases). However, after manually exploring the dataset, it became clear that the great majority of cases against the U.S. concern death penalty, even if the cases are not classified as such. We define a categorical spike in the cases concerning the death penalty as a year with 25 or more cases. 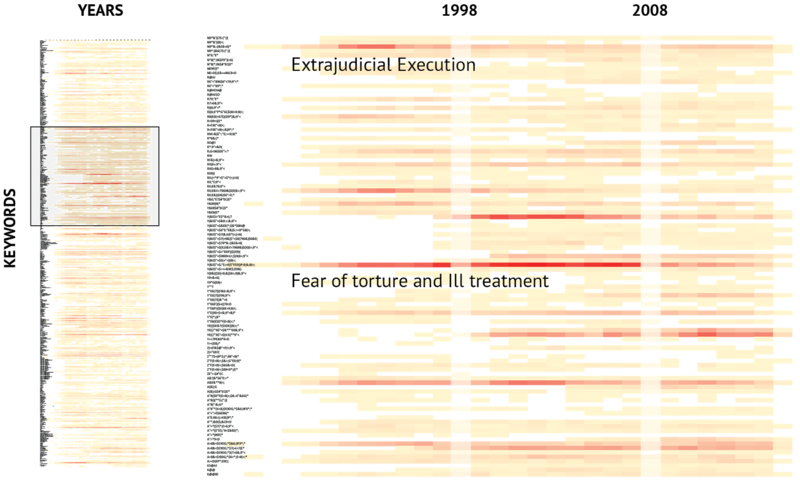 There are 8 spikes in the timeline of death penalty cases; these are 1992, 1995, and every year from 1999 until 2004. During this last spike, Amnesty International set up several campaigns against the U.S.. During this period, George W. Bush, an advocate of death penalty, was first governor of Texas until 2000, and after that, president of the U.S. until 2008. As for the cases against justice systems, there are 4 spikes in the dataset, years with 20 of more cases against the U.S. justice system. This is the period between 2001 and 2004; most cases in this category also concern death penalty. The timeline of cases against discrimination knows one major spike in 1995, when there were 18 urgent actions. Most of these cases concern death penalty. Between 1999 and 2002, there are significantly more occurrences of cases for children’s protection in the U.S., with the largest spike in 2000 with 22 cases. We can conclude from further analysis that these cases concern the protection of people who were convicted to death penalty for a crime they committed when they were underaged. The outcome of the cases in the U.S. are fairly balanced throughout the dataset. If we take into account the temporality of the outcomes, this is especially the case before 1994 and as of 2001. In the period between 1995 and 2000, the period that overlaps with a general increase of cases against the U.S., the outcomes of the cases are unbalanced. Relative to the entire timeline, 1995 can be considered the worst year, i.e. the year with the largest gap between negative and positive outcomes. In this year, there were only 9 positive outcomes of cases, but 36 negative outcomes. The best year in this respect is the year 2000, with 47 positive cases and 14 negative cases. With a total of 486 cases, Turkey is the second largest country represented in the dataset. The years with most cases in Turkey are 1994 (78 cases), 1995 (95) and 1996 (108). This period coincides with the most violent period of the civil war, when Turkish Military Forces launched several operations against the PKK (Kurdistan Workers’ Party) and the Kurdish people. This war culminated into thousands of deaths on both sides, and a massive increase of human rights violations by the Turkish Military Forces. Spikes in cases concerning detention correlate with the major spikes in the full dataset; from 1994 until 1997 there are more than 10 cases against detention in Turkey per year. The same pattern emerges when we look at the category of discrimination; only from 1994 until 1996 there are more than 10 cases against discrimination in Turkey per year. The category of torture and other ill-treatment follows a similar pattern, albeit with a smaller amount of cases. Only during the period of 1994 until 1997, are there 5 or more cases against torture and ill-treatment in Turkey. The cases against Turkey know significantly more positive outcomes than negative outcomes (10:1). In the entire dataset, there are 271 positive outcomes of cases, 27 negative outcomes, and 71 mixed outcomes. The outcomes of the cases follow a similar temporal pattern to the entire dataset; general spikes of the outcomes coincide with general spikes of cases against Turkey. 1994 was the year with relatively most positive outcomes, when 58 cases knew a positive outcome, and 7 cases knew a negative outcome. The year with relatively most negative outcomes was 1999, when there were 4 negative cases and only 1 positive case. This was the only year in the dataset for Turkey with more negative outcomes for cases than positive outcomes. Drawing on the analysis from the different parts of project, we identified three characteristics of Urgent Actions in the verified database which had positive outcomes. We ran statistical analysis of the verified dataset (using STATA software) to analyze the distribution of positive outcomes of Urgent Actions. Findings indicate that, on average, Urgent Actions’ calls for female individuals have been more successful than ones for male individuals; they also outline that, overall, Urgent Actions’ calls for individuals (so both men and women) are more successful than the ones for groups of victims. Controlling for variation across geographical regions and across categories of violations, the average statistical likelihood of a positive Urgent Action outcome for all individuals is at 67.3%. However, the likelihood of a positive outcome for a group of 2 to 8 drops to 56.1%, and for groups of 9+ it is 46.6%. Findings suggest that Detention and Discrimination are prevalent across individuals and groups in the dataset. Traditionally, Detention has been a prominent focus area of Amnesty International - for which reason, a vast majority of Urgent Actions were issued regarding detained individuals and groups. At the same time, Detention cases were seen to have the highest success rates across groups. 3. Geography of Urgent Action: Sudan. As discussed above, the highest proportion of successful Urgent Actions took place on the African continent - specifically, positive outcomes were higher in Sudan. Keck, M.E., & Sikkink, K. (1998). Activists Beyond Borders: Advocacy Networks in International Politics. Ithaca, NY: Cornell University Press. Sikkink, K. (1993). “Human rights, principled issue-networks, and sovereignty in Latin America.” International Organization, 47(3), 411-441. Willetts, P. (2010). Non-Governmental Organizations in World Politics: The Construction of Global Governance. London: Routledge.